A facelift is a surgical procedure which aims to address lax or drooping facial and neck tissue by standard discrete access incisions (in the temple hair-bearing scalp, in front of and behind the ear and backwards into the hairline) to allow firstly the underlying muscle layer to be lifted then the skin to be smoothly draped and tightened. The primary aim is to achieve an improved and more youthful appearance. There are varying techniques which address different aspects of facial rejuvenation – and this is discussed below. Typically a full facelift will also address the neck – see below for more information. Why has the procedure evolved? As part of the aging process, which happens to all of us sooner or late, our skin progressively loses its elasticity and our muscles tend to slacken. The stresses of daily life, effects of gravity and exposure to sun can be seen on our faces. The folds and smile lines become deeper, the corners of the mouth droop, the jaw line sags and the skin of the neck becomes slack. Around the eyes, the eyebrows droop and the skin of the eyelids gathers in loose folds. In the skin the first sign is fine wrinkles developing around the lips, at the outer corners of the eye and lines of expression. The rate at which this happens varies from one person to another and is probably determined by multiple factors including our genes. Ageing of the skin of the face does not necessarily reflect the rate at which the rest of the body and mind is ageing and many people feel frustrated that the face they see in the mirror does not match the age they feel. Substantial weight loss can produce similar changes in facial appearance to those of the aging process. Who will benefit from a facelift? The best candidate is one whose face and neck has begun to sag, but whose skin still has some elasticity and whose bone structure is strong and well defined. Most patients are in their 40’s to 60’s, but facelifts can be done successfully on people in their 70’s or 80’s. Ideally, it should not be too obvious that a patient has had a facelift, but instead they look younger, more vital and refreshed. It is a procedure that technically works well but also can increase morale and be well-appreciated by the patient. What a facelift does not do? A facelift works better for the lower half of the face and particularly the jaw line and neck. If you have sagging eyebrows and wrinkles of the forehead then you should perhaps consider an endoscopic brow lift. Loose skin with fine wrinkles, freckles and rough areas will benefit more by chemical peel or laser resurfacing. What are the potential complications of a facelift? Face-lifts have only achieved popularity because they are generally safe and largely predictable. As with any surgery, face-lifting is subject to complications which, although uncommon, do occur. Bleeding / haematoma (collection of blood): this complication applies to almost any surgery. It generally occurs within the first 12 hours after surgery and usually needs a return visit to the operating theatre to drain any collection of blood and attain control of any bleeding points under general anaesthesia. The risk of this is approximately in the order of 1 in 100. Wound infection: it is rare to have infection following a facelift, largely because antibiotics are used before surgery and the anatomical area has a great natural blood supply. If it occurs it is treated with further antibiotics and appropriate wound care. Poor scarring: some individuals may develop thick and red scars, so-called hypertrophic scarring. Very rarely this may progress to keloid scars. These unfavourable scars can be treated with steroids and sometimes may have to have surgical or laser revision. It is advisable to avoid vigorous massage to new scars for 8 weeks, as it takes time for skin to develop adequate strength to withstand pressure without stretching. Hair loss: this is rare and may occur as a result of tension swelling in the scalp or as a general reaction to the trauma of surgery – more so with repeated facelifts. Wound infection can also cause temporary hair loss in the vicinity of the wound. Fortunately, in most cases, hairloss is reversible but may take many months. Numbness: follows most surgical procedures and gradually decreases with time. Sometimes, small areas of the face / ear lobes may develop permanent numbness – in the latter case, there is no remedy. Bruising: this is a normal sequel to surgery and, therefore, is not a complication. The duration of bruising can vary from two to twelve weeks and depends on the extent and thickness of skin, among other factors. Injury to the facial nerve: facial nerve controls the movement of muscles of facial expression. Injury to one or more of the nerve branches will result in paralysis the muscles of facial expression. Most injuries are caused by swelling or bruising around the nerve and are therefore temporary. Permanent injuries are quite rare. Poor healing: some areas of facelift scars, especially behind ears are subjected to more tension and may receive poorer blood supply to its edges. This is particularly so in smokers and ex-smokers. It is very important to cease smoking prior to surgery for this reason alone. If healing is delayed, it may take up to eight weeks for the wound to close. Later, the scar may need revision. Skin tethering: in some areas, e.g. in the neck, skin is attached to the underlying immature scar and this has a tethering effect. In most cases this problem corrects itself with time and it may take a year. Asymmetry: most patients have some facial asymmetry and most of these cannot be corrected by face-lifting – a perfectly symmetrical result can never be guaranteed in any operation performed on both sides of the body. Any concerns about asymmetry should be discussed with Mr Andi. Unfavourable result: the outcome of this operation depends on many factors including expectations. Mr Andi can only achieve what is possible within his limitations. In spite of a good result and absence of complications some patients feel aggrieved. Further surgery may not necessarily help. You should only proceed when you are happy:- that your primary concerns (yours, not someone elses!) will be addressed with the surgery technique(s)- that you are aware of the options to treat your primary concerns along with the treatment limitations and potential complications- the person and team providing the treatment have adequate competence and would support you through not only the treatment but also any potential complication should one arise- that you are comfortable with the anticipated costs- that the timing of the surgery /recovery period are planned into you life and relationships- that you / your loved ones are prepared for the change in your appearance and how to communicate with others – eg hairdressers who may feel the scars in the scalp. If you are having intravenous sedation, you need to be aware that some patients may not be able to remain still enough for surgery to proceed despite adequate administration of sedative and local anaesthetic. In these circumstances it may be necessary to postpone the procedure and make arrangements with the hospital to perform it under general anaesthesia as soon as possible which can incur an increased cost. Surgery and anaesthesia – although remarkably safe in this country – carry known risks such as blood clots in the legs / lungs (deep vein thrombosis), chest infection (pneumonia), heart palpitations / rhythm disturbances / heart attack (atrial fibrillation / myocardial infarction), stroke (cerebrovascular accident) and (rarely) sudden death (about 1 in 350 000). It may be rather obvious to state this list but important that you are fully informed – because for informed consent any ‘serious’ risks must be presented to you even if they occur rarely for that particular operation.Your team’s objective is to minimise such risks for you – just for example, we use automatic intermittent calf compression devices throughout surgery to massage your calves and have a consultant anaesthetist monitoring and attending to you before, during and after surgery. Again, cosmetic facelift surgery has only become widely performed because the risks above can generally be controlled to a minimum. If a cosmetic procedure is ‘high risk’ it usually does not enter mainstream practice. How long does a facelift last? A facelift does not stop the clock, but it does put the clock back. The effect of the facelift is likely to always be there, in that you should not look as old as you would have done if it had not been carried out. What should I do before the operation? If you are overweight and intend to lose it you should do so before the operation. This will allow Mr Andi to remove more skin and therefore achieve a more pleasing result. You should avoid taking tablets containing aspirin and non-steroidal anti-inflammatory drugs such as Voltarol (sodium diclofenac), Nurofen (ibuprofen) for at least two weeks before surgery as they increase the risk of bleeding. You can, of course, discuss this with the doctor who usually prescribes them – this may be your general medical practitioner or a cardiologist. You should stop smoking at least two weeks before surgery as this is the main cause of reduced healing. It decreases circulation of the skin flaps, particularly behind the ears. Have your hair permed and tinted, if you wish, before your operation as fresh scars are sensitive to these chemicals for a few weeks. How is the operation carried out? Incisions are made above the hair line at the temples and extend in a discrete line down the front of the ear, or just along the edge of the cartilage at the front of the ear, and continue around behind the earlobe and up in the crease behind the ear and backwards into the lower hair-bearing scalp. Occasionally, it may be necessary to make a small incision under the chin. A facelift is carried out in a hospital and most techniques require a general anaesthetic. It is possible to carry out modifications of the procedure – e.g. the mini-facelift – under local anaesthetic and intravenous sedation but the you would still be advised to spend ~1 night in the hospital unless rigorous local supervision arrangements are in place with a competent 24 hour chaperone and pre-approved by both Dr Andi and the hospital. The procedure, although long (2.5-3.5 hours), can be combined with other operations of all sorts. The neck can be further refined / tightened by a small incision under the chin, then some fat removal followed by joining together the platsyma muscles in the midline of the neck (technically known as a submental lipectomy and platysmal plication) and this can add a further ~ 1 hour to the procedure. Other common procedures sometimes performed together would be a brow lift and an eyelid reduction with or without a chemical peel. According to the individual case, other possible procedures performed with a facelift are malar (cheek bone) and chin augmentation and lip enhancement. This is obviously to maximise the benefit of one general anaesthetic and condense the period of ‘down-time’ or recovery time outside of your social and professional network. A skin-only facelift is where only the skin is lifted following separation from the underlying platysma muscle – while this may work occasionally in the right patient, this technique has been largely abandoned, as it probably does not last as long and the scars may stretch and become more visible. More usually, however, the facial / neck plastysma muscle and its soft tissue attachments (superficial muscle-aponeurotic system or S.M.A.S. Facelift) is dissected free, lifted, tightened and gently sutured in front and behind the ear. Fat along the jaw line and under the chin may be removed by liposuction or, on occasion, through an incision under the chin. An extended S.M.A.S. lift is aimed to have a better effect in treating deep nose-to-mouth lines, deep or extended SMAS facelift was introduced many years ago. There are variations to this technique, but they all attempt to correct the same problem. This technique is much more demanding on the surgeon’s skill and experience, and the risk of nerve injury is slightly higher. 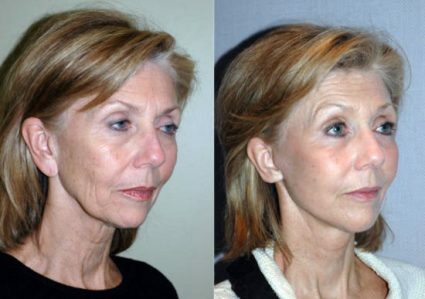 However, in the right patient, investing the extra time in this technique affords the best result in facelifting at present as it’s more extensive surgery can best combine with a neck lift (extended S.M.A.S. face and neck lift) for a more complete result (about 4.5 hours of surgery). For the mini-facelift, less undermining is required and there is still adjustment of the S.M.A.S. layer. Every individual’s case is different and this latter technique is growing in popularity – particularly with the less aged group; those who either need less lifting or wish for a more subtle effect. A mini-facelift can be performed under local anaesthesia and intravenous sedation – so there is less hangover effect and the costs can be lower. The skin layer is draped over the smoothed S.M.A.S. layer, trimmed and sutured as a separately – so that it is lifted upwards and backwards, just as when one lifts the skin when looking in the mirror. Sometimes drains (thin plastic tubes for suction drainage into small plastic vacuum bottles) are inserted which are generally removed the next day. Mr Andi will bandage your face to minimise bruising and swelling. These bandages will stay for one or two days and the sutures are removed in 7 to 10 days. After your surgery there is usually some bruising of the cheeks and with gravity this tends to descend towards the neck / chest over time and changes colour as it resolves. Discomfort is usually mild and can be controlled with Paracetamol. It is normal for there to be some numbness of the skin of the cheeks and ears. This will usually disappear in a few weeks or months. Anyone undergoing facelift surgery must appreciate that it carries the small risk of weakness of muscles in the face which, if it occurs, is usually temporary but may be permanent. Part of the reason for the growing popularity of the procedure is that such complications are thankfully uncommon and the modern techniques are more predictable. It is better to keep the head elevated for a couple of days to reduce swelling. Avoid strenuous activity, saunas and massage for at least two weeks.At the beginning your face will look a little puffy and may feel rather strange and stiff. Scar formation at the line of incision is a normal outcome of facelift surgery. The scars can be very well hidden by women with their hair and disc shaped earrings so that they should be able to resume work and social activities within a couple of weeks. Camouflage make-up can be helpful in masking bruising and the skin will be stable enough for make-up 7-10 days after surgery. Only make-up which is non-perfumed should be used – and which you have used/tested before without any adverse skin reaction. To conceal pink scars in the initial healing phase, a green pigment base powdered make-up can be used with skin tone foundation as the next layer. Men find it more difficult to disguise the scars which can look pink for weeks – months and will need to shave their beard somewhat closer to the ear in front and also behind the ear where the skin has been lifted. Pink scars become pale again over 4-12 months but this process can be accelerated by the use of green light lasers to close the extra capillary vessels in the fresh scar wound – do ask Dr Andi about the availability of this service before proceeding with surgery if pink scars are of a concern you. The scars in the hair do not usually show except that the hair is cut shorter immediately around the wound. To keep the normal position of the hairline as the skin is lifted, it can be most cosmetic to have an additional scar immediately along the temporal hairline – it is helpful to discuss with your surgeon if you prefer a higher hairline position after surgery rather than this additional scar. On the whole, scars are not “mature” and continue improving for at least one year after surgery. Sometimes scars may have to be revised if they are thick or visible. In a few patients with poorly elastic skin it may be necessary to tighten the face after six months or so. When making a decision about having cosmetic surgery, it is important to weigh up the pros and cons. It is particularly important, because cosmetic surgery is not medically necessary and the benefit can be measured in purely psychological terms only. I have never experienced such exceptional approach and diligence, which makes a such difference! Mr K Andi provided me with such excellent and high quality care. Dr Andi has an excellent ''manner" by which he treats his patients, which is bound to put even the most anxious of patients at ease. I cancelled my other consultations with other surgeons as I could trust Mr Andi completely. He knows exactly what he’s doing and wants the best solution/result for you.